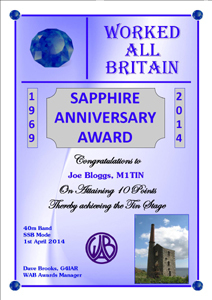 Please Note: The Sapphire Award has now finished. No further Award claims may be made. The year 2014 sees the 45th Anniversary of the Worked All Britain Awards Group (W.A.B. ), founded by the late John Morris, G3ABG. To celebrate this occasion, for this year only, we are issuing an Award based (loosely) on the number 45. The 45th anniversary, whilst not widely celebrated, is the Sapphire one. 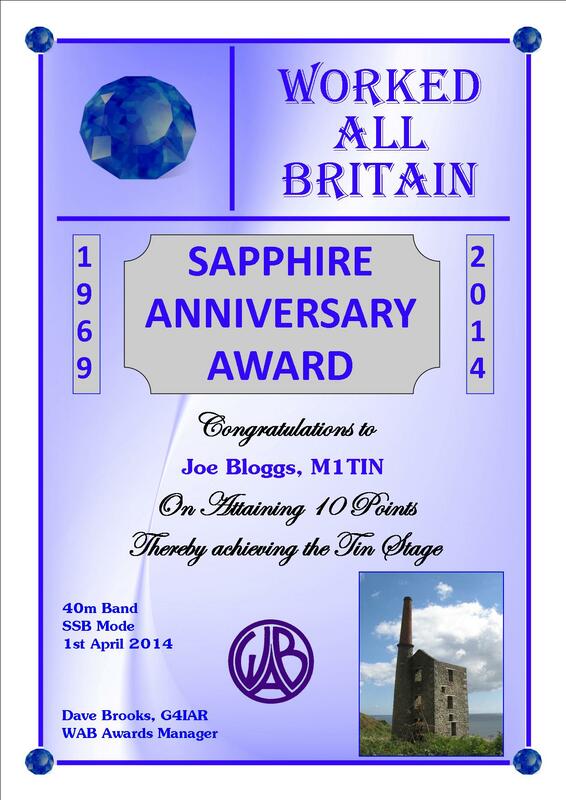 WAB have decided to break the mould and celebrate this anniversary by introducing a Sapphire Anniversary award. The award is based on the number 45 and stages of this award have endorsements corresponding to the less usual anniversaries. There will be 5 stages of the award, culminating in a trophy for the top (Sapphire) class. There are two categories of the award depending on the global location of the station and the frequencies used for collecting and a further one for activating the award. All contacts must be made within the 2014 calendar year, i.e. 1st January - 31st December 2014. As with all W.A.B. Awards, this one is endorseable for individual bands/modes. We hope that you will be able to join in our celebrations. Following requests from members and in view of the high level of activity and achievements in the early part of this year, the W.A.B. Committee have decided to increase the levels of the award attainable beyond the initial trophy. To this end, further trophies can be claimed for attaining multiples of 45 points, with the required squares increasing by the same factor.